The way that the $10/month fee is presented in the press release seems to imply that it would only be applicable to those who can take advantage of Sprint’s 4G network, which is still in the process of rolling out in many parts of the country. However, after seeking out further clarification, it is apparent this is not the case. 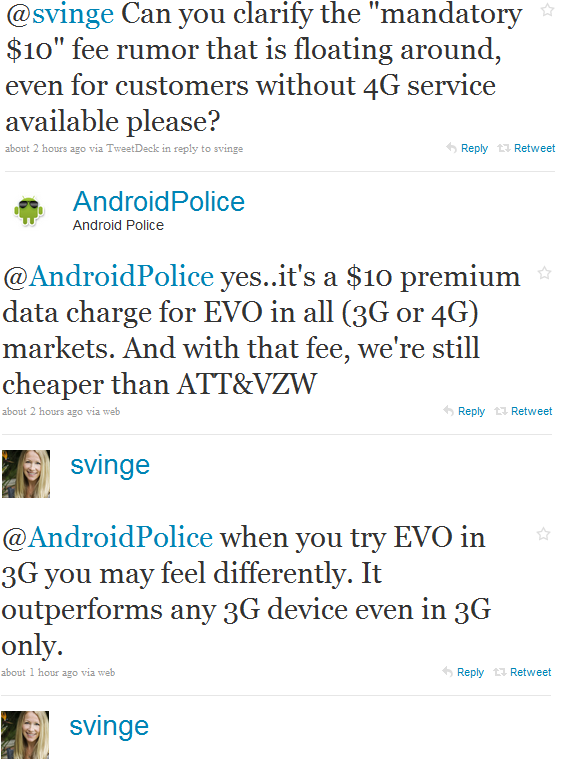 Instead, if you pick up an EVO 4G, whether you can get the 4G data speeds or not, you’ll be shelling out an additional $10 per month. Here’s the thing: So what? You know what else has a ‘faster processor’ and an 8 megapixel camcorder/camera (albeit with a slightly smaller screen, but last I checked my screen isn’t using any data on its own)? The Droid Incredible, and last I checked Verizon wasn’t about to start charging an extra $10 a month because it anticipates its users will be using greater amounts of data. If this charge were to apply to only those who can use the 4G network, fine, that would be reasonable as you’re getting something tangible in exchange for a monthly fee. But instead, you’re getting stuck with an extra $10 a month, regardless of whether or not you’re using their 4G network, because you might use more data. This isn’t the perfect analogy, but think about this: what if you purchased a new, faster computer and your ISP decided they’re going to charge you $10/month extra because they think you’re going to use additional bandwidth as you take advantage of your computer’s new features? Never mind that the $10/month will not actually net you a tangible change in internet speeds since you’re not in their super-ultra-mega-fast-broadband service area, but that computer sure is shiny and we know you’ll be tempted to clog the tubes with your Youtubing, so we’ll go ahead and charge you anyways. Now, playing Devil’s advocate, I do understand that network capacity can be a scarce resource – we’ve all had friends gripe about awful experiences with AT&T after the iPhone was introduced. But with that being the case, why not just charge the big offenders? Or why not have the extra $10/month be opt-in for those that do plan on really taking advantage of the phone’s multimedia features? As you can probably tell, I’m none too excited about the new change – however, I’ll probably end up getting an EVO 4G regardless. Do you think it’s fair to have to shell out the extra $10/month if you live an area that isn’t covered by 4G? Is this charge going to change your decision to buy the phone? Leave your thoughts in the comments!